Edie Grace’s first day of school this year was the second time in her life that I did not drive her to school. She began a couple of weeks after most of her classmates because, even though she is technically a senior at SHS, she is taking all of her classes at GSU. Edie Grace is both a high school senior and college freshman simultaneously. I knew this time would come, but boy does it make Lori and I feel old…and just a little bit sad. Seems like just yesterday I was putting her on the bus for her first day of kindergarten. We did continue our tradition of having our first day of school image taken together. 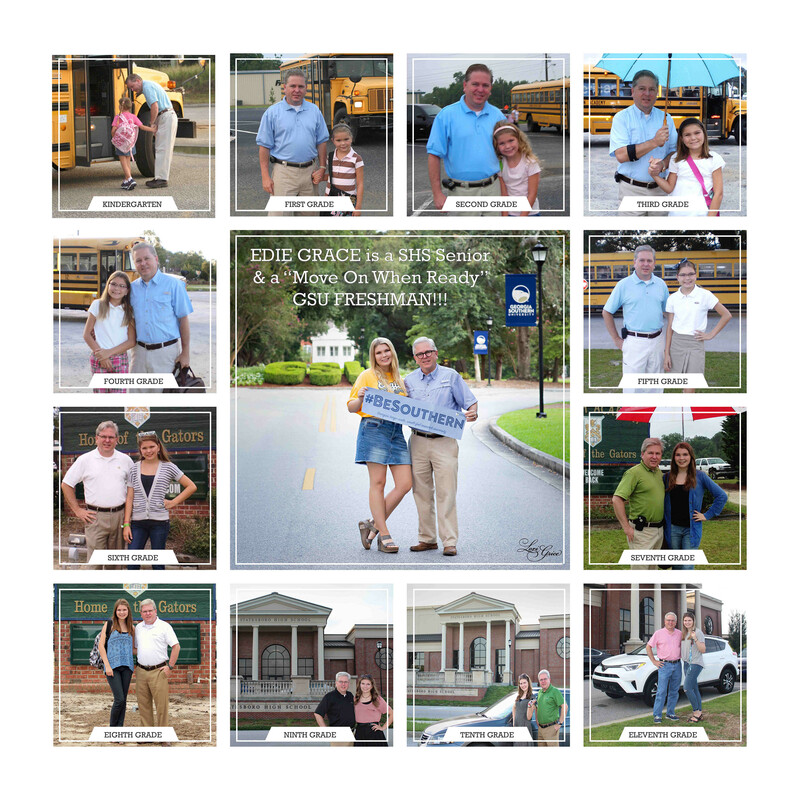 Thanks to having a Mom that has spent her career preserving precious memories for others encouraging us to, at the very least, take a quick snapshot we now have a pretty awesome collection of first day images. These document her growth and maturity and my grey hair, persistent aging and inability to control my weight – especially as I get older. Edie Grace has an exciting year ahead. Thanks to Georgia’s wonderful “Move On When Ready” (MOWR) program she is fully enrolled at GSU. She is also looking forward to serving as Vice President of the National Honor Society at Statesboro High and continuing her many community commitments. Edie Grace is a working girl also. She is continuing her job at CRI (the “RAC”) on the GSU campus and helping out some at Free Spirit Pottery also. Of course, we are traveling the world creating every imaginable image possible to capture her senior year and this incredible time in her life. Our favorite stop on her “Lori Grice Senior Portrait journey” so far is Cuba. We are most proud of her “can do” spirit, graceful attitude and giving heart. Every day with Edie Grace is a wonderful blessing for me and Lori. It is a journey that never stops surprising us, thrilling us and showing us the power of unconditional love. We tell her everyday that simply “showing up” is the biggest key to success. She certainly shows up every day with a passion and vigor to change the world. Hopefully, this spirit will continue to carry her through this year and for the rest of her life. We hope this school year proves to be another great year for your children and your family also. Life is a precious gift. Enjoy every moment of it and celebrate with your children every opportunity you can.